Does anyone know if I can still buy a single seat tail unit ? If so ware from? 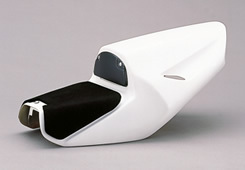 Whaccessories.com i believe has some, may take a little fab work to make some work... if your looking for stock look, i know webike japan still has magical racing bodywork, not sure if they have the tail piece but take a look. One uses stock seat, makes it look like a single. The other needs foam or whatever you create. I still see decent ones on Ebay now and then. taskmasta posted a group order on https://japan.webike.net/. Check them out. check out bespoke carbon in the uk, they've just started up in the uk, they're in the process of building their website, you can contact them via facebook, you can buy carbon fibre or fibreglass, you can even have different coloured carbon fibre. Awsome, thanks for all ur help. 2 piece suit $250 ! Wore once!